This months blog touches on the need for a structured approach to your training programme and the benefits of planning to maximise your training gains. 2018 has been an incredibly frustrating year thus far for me, in terms of training. I’ve been suffering from several injuries, a few of which have pretty poor long term prognosis. This has led me to a very restricted training programme and an inability to work several joints of my body. It has forced me to think strategically about what I can improve whilst I’m injured, and how I can work around the injuries to reduce the amount of regression in all the areas I can’t train. I’ve been able to do this with an element of success, but it has got me thinking about the broader subject of people getting the best out of their training, for whatever goals they may have. Getting the best out of your training in my opinion requires careful planning and scientific backing. The best training programmes are built on principles of specificity, overload, progression and reversibility. I’ve been using the FITT acronym to help remember the key things to consider when tailoring programmes for individual fitness, sporting or performance goals. It stands for; Frequency, Intensity, Time and Type. Calculating the target zone also helps assess how much aerobic or anaerobic training you need to do, to improve fitness. It goes without saying, training should be matched to an individual’s needs! By using some basic principles of training as a framework, you can plan a personalised training programme that uses scientific principles to improve performance, skill, game ability (if you train for a sport ) and physical fitness. A successful training programme will meet individual needs which are personal fitness needs based on age, gender, fitness level, goal, body type and if relevant, the sport for which you are training. A successful training programme will also include exercise in the correct heart-rate target zone. • Specificity – training must be matched to the needs of the sporting activity to improve fitness in the body parts the sport uses. For example, don’t expect to get better at rowing unless you spend a considerable amount of time training on the Rowing machine, or improve your 1 rep max back squat without back squatting heavy. • Overload – fitness can only be improved by training more than you normally do. You MUST work hard. • Progression – start slowly, gradually increase the amount of exercise and keep overloading. • Reversibility – any adaptation that takes place as a result of training, will be reversed when you stop training. If you take a break or don’t train often enough, you will lose fitness. • Frequency – decide how often to train. • Intensity – choose how hard to train. • Time – decide for how long to train. • Type – decide which methods of training to use. You should also consider the principle of moderation. It is important to have rest periods which allow the body to adapt. Too much training (overtraining) can lead to injury, something I have learned the hard way over time. The correct amount of rest keeps your body (and more importantly) mind, fresh. Reversibility is an interesting subject to me, having not been able to do any resistance training on my upper body for 2 months and very little else, other than a stationary bike and core work. The speed with which body composition changes and reversibility in fitness differs, I’m convinced, from person to person based on genetics, diet, lifestyle and age etc. I’ve found during my enforced lay off, that my aerobic capacity and lactic threshold on the bike has significantly improved with sustained work on the bike. However, my top end anaerobic power has decreased, partly due to the lack of strength and power training, coupled with the increase in the aerobic duration work and the loss in total body weight ( mixture of muscle and fat). I’ve always been a believer in specificity and that you can’t expect to excel at a domain without training predominantly in that domain. I trained for the London marathon in 2005 by doing no running. I rowed, cycled, boxed, swam and trained in the gym, and was the fittest I’ve ever been. I had Vo2 max of 55ml/kg, but the lack of running meant I still under achieved in comparison to other athletes who had less capacity, but had got the miles in running, as my body hadn’t adjusted to the domain through the principal of specificity. I could use the analogy of “you can’t cook an omelette without cracking an egg” and it’s the same with your training. Whether it’s having a specific area of your training you want to improve, an energy system you want to improve, a lift you want to increase, you HAVE to give focus to that domain for a sustained period to reap improvements. It’s hard to be all things to all people and its the same with your training. You’re going to find it hard to put 30kg on your back squat whilst improving your half marathon time, or from a composition perspective, put on significant muscle mass whilst losing body fat. Arguably Elite level CrossFit athletes have this conundrum to solve the most, due to the breadth of domains and energy systems they need to be strong in. The balance is trying to focus on areas you want to improve whilst not losing ground in the areas you’re already strong in. This balance is best achieved with a carefully thought out, scientific based, training programme and it goes back to the point I was making earlier about Reversibility! You cannot afford to go “cold turkey” in an area of your training and expect not to regress. However, you can maintain areas whilst significantly improving others, and that is the advantage of a well thought out training programme specific to your goals. I’m a huge believer in the benefits of heart rate zone training for all levels of athletes and gym goers, and recommend my PT and programming clients to invest in a HR monitor/strap. During my enforced injury lay off, I’ve taken the opportunity to work on my Lactate Threshold. This involves prolonged periods directly in and around my Lactate Threshold heart rate, (the point in which my body starts to produce considerably more lactic acid) with the end goal of pushing this point to a higher heart rate, thus being able to work at a greater intensity whilst producing less lactic acid. This has been a strange block of training as a large percentage of the heart rate zones I’ve been working in, feel incredibly comfortable, and leave you feeling like you haven’t really put in enough effort. However in this instance, less is more and having the discipline to stick to the prescribed Heart Rate Zone, even though you aren’t sweating as much or feeling the same level of fatigue or “burn”, leads to an ability to work harder whilst producing less lactic acid. This is a hard concept to explain and more importantly, to get PT and programming clients to believe in, but it is arguably the most overlooked area of training. The physiological, metabolic and haematological benefits of targeted training volume at the lower ranges of your max heart rate, include increased blood volume, stimulation of aerobic enzymes, stimulation of fatty acids as a fuel source (who doesn’t like that) and increased capillarisation. From a practical point of view (and I can only speak from a restricted training protocol at present) my numbers have improved drastically across max output over 10, 30 and 60 minutes on the Assault Bike. It’s easy, especially if you only get to train 2 or 3 times a week, to just want to come in and thrash yourself at redline every session, but if you are serious about your training and performance, I encourage you to think strategically about your heart rate zones during your aerobic and conditioning work. 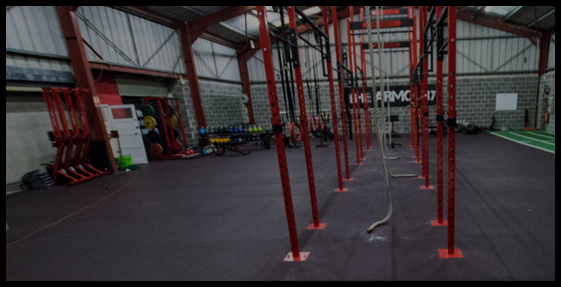 If you have any questions around heart rate training zones, or are interested in a personalised training programme, either grab me at the gym or drop us an email at info@armourygym.com.